The “Oushtab” or “Abr” (Persian for cloudlike) dyed fabrics are the most visually dramatic woven textiles of Central Asia. 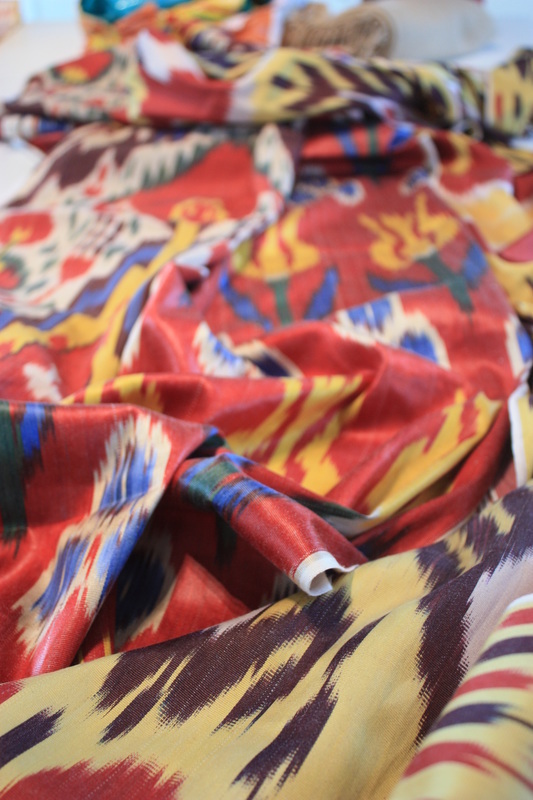 Produced chiefly in Uzbekistan, or by Uzbeki in Aghanistan, these ikat fabrics are characterised by shimmering, soft edged designs in vibrant colours and owe their beauty to the technique of binding and dyeing the patterns on to the warp threads before they are set on the loom. Like clouds, the motifs appear to float unbounded, their edges softly blending into the adjacent colours. To wear abr silk clothing remained an exclusive privilege until the twentieth century. (Janet Harvey, 2002). 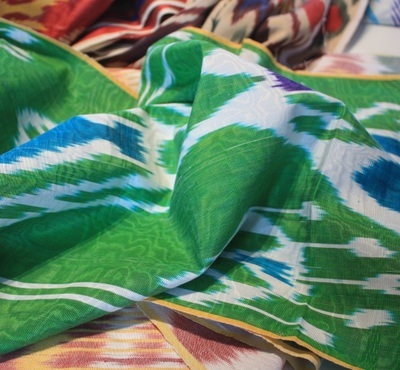 Ikat fabrics are also used to make the traditional ‘chapan’ coat for men. Strawberries Fabrics has a small number of unique pieces in stock. Strawberries Fabrics stocks a small collection of suzani or bukhara embroideries. Suzani is the name for large embroideries that are traditionally used as hangings and curtains in the houses and tents of the peoples of Central Asia. The best suzanis are produced in Uzbekistan and particularly around the town of Bukhara, which explains why suzanis are also sometimes referred to as bukharas. Bukhara work is normally embroidered with flowers and meandering vines. 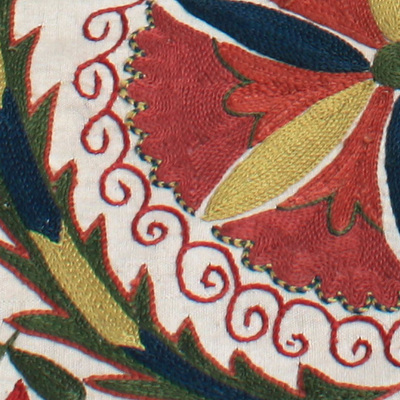 Suzanis are traditionally embroidered by the women of the family for a girls dowry. The design would be drawn out on four to six strips and each strip was given to a different embroiderer in the family. The finished strips would then be stitched together and this explains for the slight misalignments often seen in these large embroideries (Jeanet Harvey;Traditional Textiles of Asia; 2002). The art of suzani making is still practiced today. The suzanis from Strawberries Fabrics have been produced in either Uzbekistan or Afghanistan and different qualities are available; varying from very old, very fine embroidery to newly made, more modern designs and colours.